Perth, Fremantle and the Swan River make for a unique combination of water and shore based activities which is rare. Join us and discover our wide range of services tailored to make your experience unforgettable. We guarentee that you will have a good time and will want to come back for more. Activities ranging from Twilight River Cruises to sitting as close to the Australia Day Fireworks as you can get are all on offer. Do not hesitate to contact us for more information or simply check out the activities via the buttons below. There are a few skyshow events each yet, the biggest being the Australia Day fireworks on the shore of Perth City. 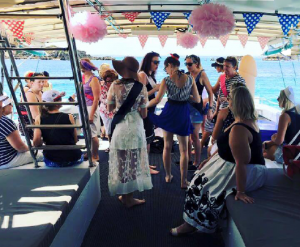 What better place to celebrate this event than on the deck of a Charter Boat equiped to catered for your party guests every need. We also charter for corporate and private functions. Simply Contact us today for more information. Provided: Tea/Coffee, BBQ and catering services also available. Choose to either travel up the river as far as rocky bay or go out into the ocean and see the coast from the boat. This package is ideal for a corporate charter or a group of visitors wanting to experience Perth City from the River. A unique experience is guaranteed. Follow the epic annual migration of humpback, southern right whales and the rare blue whale, from the food-rich Southern Ocean to warm breeding grounds on the north Kimberley coast.